Clean-up. Change "harvnb" tags to "sfn". Zen is the Japanese form of Chan Buddhism, which was imported into Japan in the 12th century. Zen/Chan emphasizes direct insight into the nature of reality that is developed primarily through combining the practice of sitting meditation with a direct mind-to-mind transmission from master to disciple. While both philosophical study and good works are also emphasized in this school, these are considered of little use without the wisdom that comes from direct insight into true nature of reality. In this view, while philosophy and positive actions play in important role on the spiritual path, obstacles arise if the student becomes overly attached to these methods. Buddhism was introduced in Japan in the 8th century CE during the Nara period (710-794) and the Heian period (794–1185). Zen was not introduced as a separate school in Japan until the 12th century during the Kamakura period (1185–1333), when Nōnin established the Daruma-school. In 1189 Nōnin sent two students to China, to meet with Cho-an Te-kuang (1121–1203), and ask for the recognition of Nōnin as a Zen-master. This recognition was granted. Soto too spread out over Japan. Gasan adopted the Five Ranks of Tung-shan as a fit vehicle to explain the Mahayana teachings. The Meiji period (1868–1912) saw the restoration of the political importance of the Emperor after a coup in 1868. At that time Japan opened up to Western influences, restructuring all government and commercial structures to Western standards. Shinto became the state religion and Buddhism was coerced to adapt to the new regime. The Buddhist establishment saw the Western world as a threat, but also as a challenge to stand up to. Interest in Zen grew in the West after World War II. 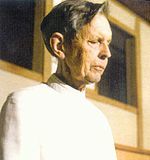 Westerners such as Philip Kapleau and the Dutchman Janwillem van de Wetering went to Japan to study Zen. Japanese teachers came to the West to share Zen practice and philosophy. Zen meditation is the essential method of Zen. In Rinzai Zen this is supplemented by kōan training. Zen emphasizes zazen: meditation as the means to awakening. There are various methods of meditation. In Buddhism two main approaches are used, vipaśyanā (awareness training) and śamatha (concentration of the mind). Zen Buddhism emphasizes samātha. The Japanese word Zen is derived from the Chinese word 禅, pinyin: chán, which is derived from the Sanskrit dhyāna "concentration". The Japanese word zazen means "sitting meditation". However, Zen meditation ideally is not only concentration, but also awareness: being aware of the continuing changes in our consciousness, of all our sensations and our automatic reactions. In alteration with zazen, there is walking meditation, kinhin, in which one walks with full attention. The traditional schools of Zen in contemporary Japan are the Sōtō (曹洞), Rinzai (臨済), and Ōbaku (黃檗). Of these, Sōtō is the largest and Ōbaku the smallest. Besides these there are modern Zen organizations which have especially attracted Western lay followers, namely the Sanbo Kyodan and the FAS Society. Sōtō emphasizes meditation and the inseparable nature of practice and insight. Its founder Dogen is still highly revered. Rinzai emphasizes kōan study and kensho. The Rinzai organisation includes fifteen subschools based on temple affiliation. The best known of these main temples are Myoshin-ji, Nanzen-ji, Tenryū-ji, Daitoku-ji, and Tofuku-ji. Thomas Merton (1915–1968) was a Catholic Trappist monk and priest. [web 4] Like his friend, the late D.T. Suzuki, Merton believed that there must be a little of Zen in all authentic creative and spiritual experience. The dialogue between Merton and Suzuki explores the many congruencies of Christian mysticism and Zen. ↑ 1.0 1.1 Script error: The function "harvard_core" does not exist. ↑ Breugem 2006, p. 39-60. ↑ Dumoulin & 2005-B, p. 7-8. ↑ Dumoulin & 2005-B, p. 14–15. ↑ 5.0 5.1 5.2 5.3 5.4 5.5 Script error: The function "harvard_core" does not exist. ↑ Dumoulin & 2005-B, p. 151. ↑ 14.0 14.1 14.2 Script error: The function "harvard_core" does not exist. ↑ 15.0 15.1 15.2 15.3 Script error: The function "harvard_core" does not exist. ↑ 20.0 20.1 Script error: The function "harvard_core" does not exist. ↑ Mumonkan. The Gateless Gate. ↑ Jalon, Allan M. (11 January 2003). "Meditating On War And Guilt, Zen Says It's Sorry". The New York Times. ↑ A Chronology of Thomas Merton's Life. The Thomas Merton Center at Bellarmine University. Retrieved 26 March 2008. This article includes content from Japanese Zen on Wikipedia (view authors). License under CC BY-SA 3.0. This page was last edited on 31 December 2018, at 21:21.